5 Star Customer Reviews on Google! AAA Overhead Door Inc. Established in 2001. Serving the Greater Jacksonville and Hilton Head Island Communities. We’re a local, community based garage door service company. AAA Overhead Door Inc .
AAA Overhead Door Inc. is full service garage door repair and electric opener installation company serving the greater Jacksonville, Florida; Hilton Head, Bluffton and Beaufort, South Carolina areas. The company prides itself on being a locally owned, family oriented business who values their customers and appreciates the opportunity to provide excellent Garage Door services to their community. Founded in 2001 by long term Jacksonville Beach resident Mark Rogers, the company has worked hard over the years to grow their presence and build their brand around solid service and a simple premise – take care of your customers and treat everyone fairly. Why choose AAA Overhead Door? We’re a local, community based company, and carry top quality products which exceeds our competition. Our showroom, located at our corporate office in Atlantic Beach, Florida offers customers a chance to review the latest in garage door amenities. Our sales team in both locations work directly with customers to provide fast, free estimates on any garage door need. Every customer counts and we want 100% customer satisfaction. That’s something that we stand behind. That is what we genuinely want. That’s what it’s all about. 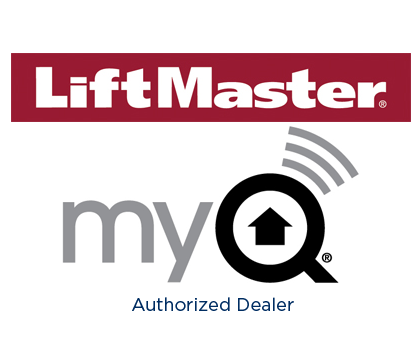 Your garage door is the largest moving object in your home and your primary point of entry yet industry data* reveals that the majority of homeowners ignore the most basic elements of garage door maintenance – lubrication and safety inspections. AAA Overhead Door Inc. offers preventative maintenance services on all garage door and opener make and models. We provide training for our customers on proper maintenance that they can safely perform themselves. We also offer an affordable, yearly maintenance plan to keep your garage door in perfect working condition. At AAA Overhead Garage Doors every customer counts. No job is too little. No issue too big. We want to help you. We want to deliver 100% customer satisfaction every time. It’s why we’re in business. Call our office today for pricing or a FREE estimate. 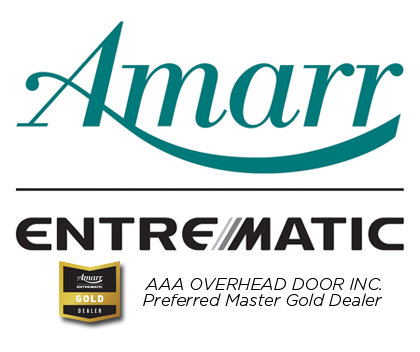 Amarr / Entrematic is one of the world’s leading designers of garage door access systems. Amarr manufactures high quality, durable and safe door access systems. AAA Overhead Door is a family-owned and operated business. We’re not a franchise. Our reputation is based on our work. We 100% GUARANTEE your satisfaction. Important reasons to choose AAA Overhead Door for all your garage door needs. “In 1997 I started working as a technician for a national garage door company. I was good at garage doors, honest by customers and liked the work; however, I had moved to California for the opportunity and found myself missing home. So in 2001, I decided I was coming back to Jacksonville and would start my own garage door business servicing Fernandina Beach. I decided to start in that market because it was just a jump across the ferry and there were very few garage door companies there at the time. I knew the market needed someone good and I was ready to do a good job for people in my community. 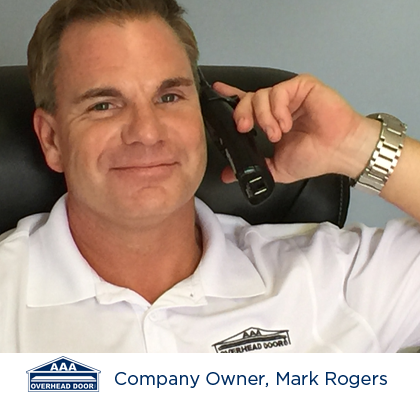 -Mark Rogers, Founder and CEO AAA Overhead Door Inc.
AAA OVERHEAD DOOR – Serving Jacksonville & Hilton Head Locations. Our Jacksonville and Hilton Head certified technicians are capable of repairing any garage door or electric opener operating system manufactured by any brand. Customer Reviews: We Love our Customer’s, And They Love Us. We are fully dedicated to providing the best garage door services on our community. When you call AAA Overhead Door, there is no need to worry about your complete satisfaction. With over 80,000 customers and counting, you cannot go wrong with choosing AAA Overhead Door from the competition. Check out what our customers are saying about us! It’s been approximately one week since Shawn Hines came to fix our garage door, and we feel confident he has truly fixed the problem. It was the third time AAA came to our home and after replacing the circuit board and addressing a few other concerns. Our door is finally behaving properly. Shawn was extremely professional and listened to all the problems we are having before proceeding to fix each and every one. Because of the time and attention Shawn showed us we will definitely recommend AAA Overhead Door to anyone who asks about our experience. AAA provided amazing service. They arrived at the front of the two hour window after providing a 30-minute courtesy call to let me know they were coming and give me time to get to my house from work. Once they arrived they immediately got to work, and worked fast and efficient. AAA was recommended to me by a friend and I wouldn’t hesitate to pass on my recommendation to anyone who asked. Efficient work of replacing two garage door springs. I appreciated them spending extra time in maintaining the garage door itself after the springs had been replaced. Its good to see people have pride in their work. I’d highly recommend them. Loved Loved Loved my experience with both techs – very professional and extremely talented and polite. I highly recommend AAA Overhead Door! They are outstanding! AAA Overhead is THE BEST ANY WHERE around. They are professional, thorough, inexpensive and quick. I had them put a garage door in several of my houses and told others about them and they call back and get the job done. I have only had to call two times in 10 YEARS. Yes, that’s right 10 years same door, no new parts and just standard maintenance. 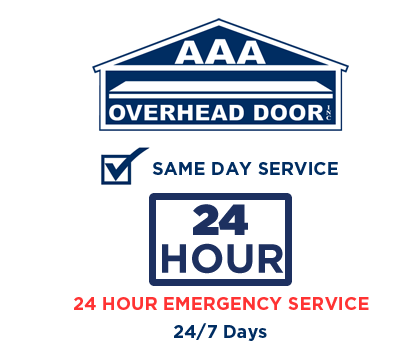 I will ALWAYS use AAA Overhead for any new doors and repairs, even though I have not had to have any repairs when AAA puts the door in to begin with. If you have an existing door, they return your phone call and are fixing your door usually the same day. BEYOND OUTSTANDING, EXCELLENT SERVICE!!!!!! Duke and Joe were professional and prompt. They were helpful in explaining what was wrong with the garage door operator. I recommend this company. They were able to give me an appointment same day! Join our growing list of over 80,000+ Satisfied Customers!